Learn how various network enhancements that have been proposed and implemented complement each other to deliver a comprehensive solution. If you’re looking to take the lead in the 5G development and deployment race, you need a partner with the right experience and expertise to help you move forward. 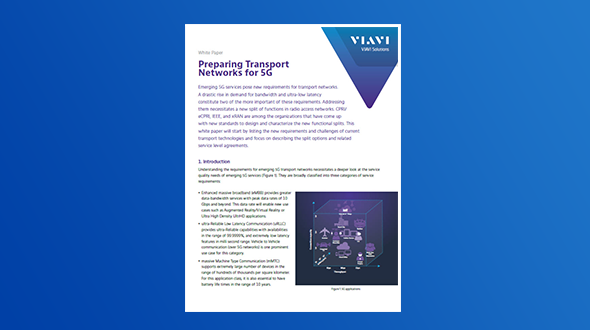 VIAVI has been a driving force in 5G since 2013, partnering with the world’s top communication providers and other leading organizations to deliver the solutions needed to develop, test, enable, assure, and optimize autonomous networks with speed and success in both the lab and the field. Only VIAVI offers complete solutions for 5G validation, verification, and visibility. Our lab-based network test solutions enable our customers to analyze, develop, and validate the performance and capability of a variety of network functions and devices. With the ability to test all key wireless, cellular, and IP technologies worldwide, our solutions ensure networks are robust enough to cope with the complexity and demands of devices and traffic at scale by validating the impact of real-life conditions across the entire network, testing subscriber QoE. Our 5G test and verification solutions span across devices, radio, ad hoc network clusters, radio access networks, transport, core and services for verticals to deliver essential visibility for 5G end-to-end programmable and dynamic networks. Used together, our solutions enable the rapid isolation and resolution of issues. 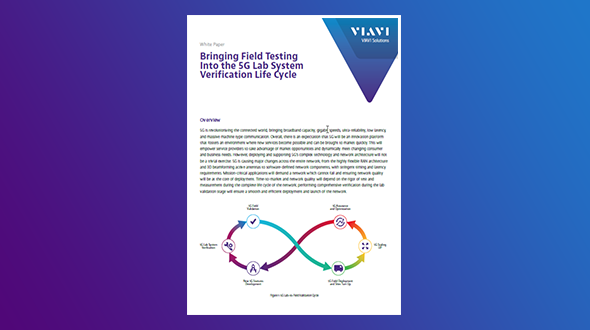 Learn how performing comprehensive verification during lab validation ensures a smooth and efficient launch of a 5G network. See which operators have launched or plan to launch commercial 5G networks before the end of 2019. This paper reviews the potential of NB-IoT, deployment options, and the current limitations of the technology. VIAVI CTO Sameh Yamany offers a more detailed view of 5G and where VIAVI fits in.